There appears to be at present a major discrepancy between quality and value – which reminds me of the Oscar Wilde quote that “a cynic knows the price of everything but the value of nothing”. As I highlighted in a prior post, What’s Driving the Markets and How Should I Invest?, investors have seemed to push up the price of lower quality companies, leaving an opportunity to invest in companies of higher value with upside potential of reversing its underperformance versus its index. I will now show how despite there being question marks over the value of the wider equity market versus its long-term average, against other asset classes the investment case looks strong – and there’s much cash waiting on the sidelines! Just remember – Quality, Quality, Quality! As you can see from the above chart it is arguable that relative to its long-run average, the equity market is fairly priced to slightly over-valued. 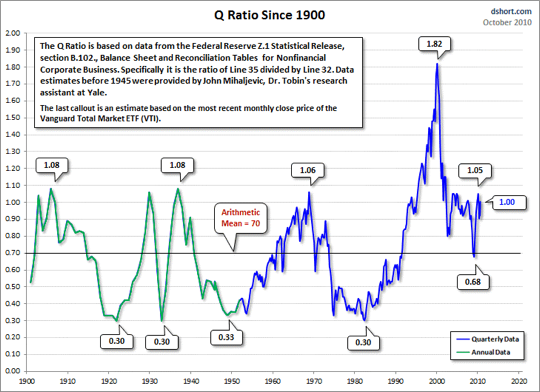 To explain, using the same great blogger who sources the chart , the avid “Charter” of financial data, Doug Short: “The Q Ratio is a popular method of estimating the fair value of the stock market developed by Nobel Laureate James Tobin. The total price of the market divided by the replacement cost of all its companies. The mean-adjusted chart above indicate that the market remains significantly overvalued by historical standards” — 41% to 52% (depending the version of calculation you choose). Despite my point on valuation, the above chart shows how little all the cash sitting on the sidelines is earning their investor and in stark contrast to the earnings yield some equities could be providing instead – a mighty enticing motivation to invest. Ok, so what about bonds? Surely that would be an equally enticing move? Perhaps better on a risk return basis? Actually no. The superior yield equities can offer versus bonds is well- exemplified in the chart below, from Jesse Felder in his contribution to Seeking Alpha, By One Measure Stocks Are Cheapest in Over Half a Century. 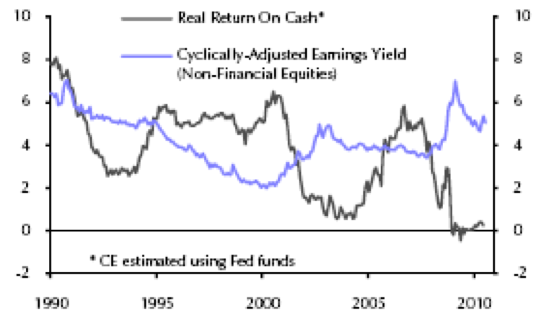 This highlights not only the motivation for a move from cash to equities, but also a switch from government bonds to equities. When discussing earnings yield it is interesting to remember Warren Buffett’s quote that: “earnings can be pliable as putty when a charlatan heads the company reporting them”, lending support to my focus on quality companies which includes the requirement of good management. I showed in my previous post, How to Play the Bond Markets, how the case for bonds is no longer a “broad-based trade” and investment grade spreads are now 63% narrower than at their 2008/9 peak and now below 2002 levels. This is a ‘stock-pickers’ market. Invest in high quality companies (strong balance sheets, cash flow rich) which have the upside potential to re-rate to their intrinsic value and having underperformed during the periods of market over-exuberance. Investing is no longer a call on the asset class alone, but rather an emphasis on specifics is coming more into play. 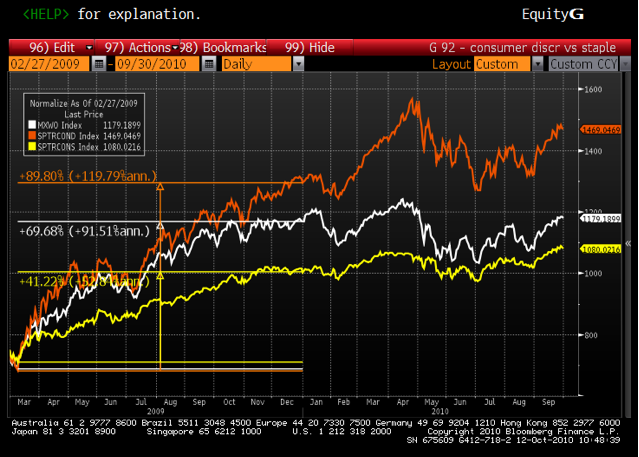 Spreads have narrowed, from their historically wide levels (see chart below from an excellent fellow blogger the Calafia Beach Pundit, Scott Granis, the former Chief Economist at Western Asset Management and Seeking Alpha certified) but Corporates are focused on managing and strengthening their balance sheets. Differentiation in returns can be seen between sectors and between names. Thus, the key going forward is credit selection and a focus on quality. I remain cautious on the high yield space, concerned with the possibility of the default rate coming in higher than expected and with lower levels of credit available to struggling companies, the recovery rate disappointing on the downside. This again highlights the importance of being name specific when investing. With spreads narrowing as far as the above chart shows, the risk / reward profile of this part of the asset class is not as attractive.